At today’s Board of Directors Meeting, Assistant City Manager Kristi Aday provided an update on the community’s efforts to improve broadband access and functionality for businesses. Access to affordable and reliable broadband is an important business recruitment and retention issue and while there are large providers already in New Braunfels, fiber is not readily affordable or available for small businesses. 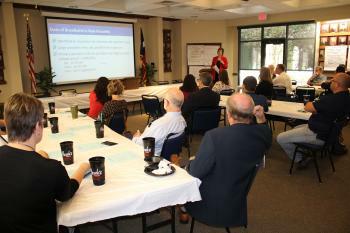 In 2014 the Chamber organized a committee of stakeholders to include the City, New Braunfels Industrial Development Corporation (aka 4B Board), NBU and the Chamber itself. A survey of local businesses found that 84% experienced moderate, server or total disruption and 69% stated current internet services were insufficient. Businesses were not upgrading because the services were not available or the price was too high. A consulting firm, Magellan Company, was hired and completed a feasibility study including a needs assessment, market analysis, and infrastructure assessment. Magellan recommended a public-private partnership would be most effective to bring accessible and reliable broadband to New Braunfels. The City via the NBIDC would be the infrastructure provider and a private company would act as the service provider. The public will be the owner of the assets (fiber, cabinets, etc.) and the private company will use those assets to provide services to their customers. The City has identified five key business areas as high priorities for expanded broadband and are in the process of created a request for qualifications to be sent in early 2018 to service providers. The estimated cost for the entire project is less than $4.3 million.